ICICI is the country's largest privately owned bank and calling the shots at its top is joint MD and Chief Executive Officer Chanda Kochhar. In her decades long association with the bank, Kochhar has played a pivotal part in the restructuring ICICI from a corporate bank to retail bank. Recollecting her life’s experience over the past twenty years Kocchar says, "The organization has grown and evolved substantially in these last 20 years. Normally, we define banks as being either retail or corporate, but ICICI transformed itself from a corporate bank into a retail bank, and now a universal bank. So although I’ve been with the same organization for the last 20 years, I’ve created and run different businesses. I joined on the corporate side of the bank. Then, when infrastructure financing became a big thing in India, I set up the infrastructure-financing practice for the bank. When commercial banking opened up for the private sector, I set up the retail-banking division for ICICI and grew it substantially. I then ran the international side of the ICICI Bank for a few years. Having run all the businesses, I’m now a supervisor, overseeing a number of functions: finance, risk, audit, compliance, industrial relations, all those kind of things. It’s been a great journey for me." 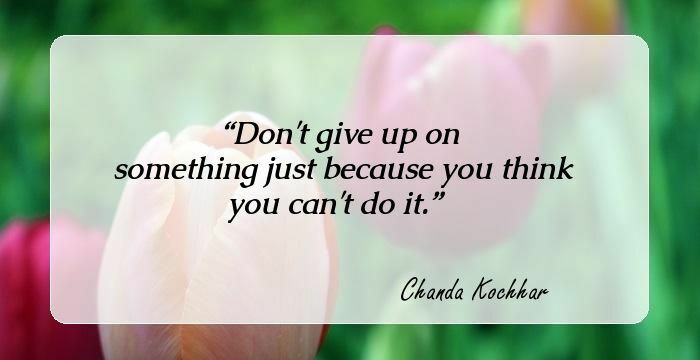 Here are a few inspirational quotes by the leading businesswoman Chanda Kochhar. 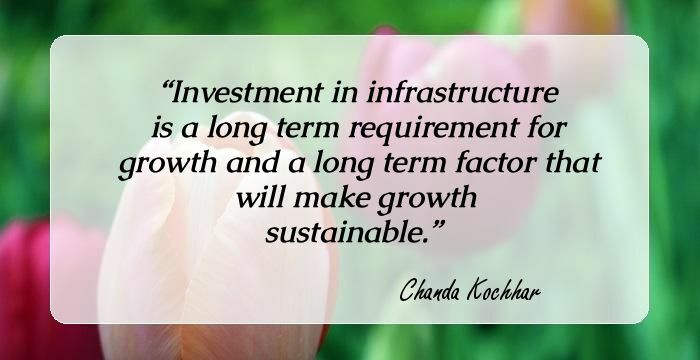 Investment in infrastructure is a long term requirement for growth and a long term factor that will make growth sustainable. 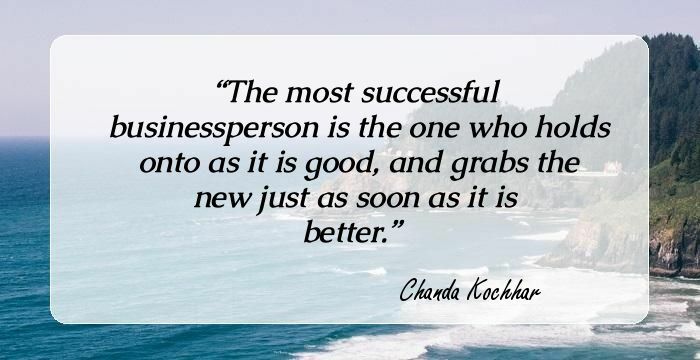 The most successful businessperson is the one who holds onto as it is good, and grabs the new just as soon as it is better. There were so many occasions when I wasn't around for my kids or my husband. But we learnt to work around it. What my parents believed was that, you know, the best wealth they could give to us children was to educate us and, you know - give us that foundation. We need to start work with the idea that we're going to learn every day. I learn, even at my position, every single day. Clearly, for an organization to move on, it is the job of the leader to be that sponge that takes the stress from inside and the outside. I chose to be a working wife and mother. Why should I compromise on either?